The 3-star superior Hotel Cà Bianca is ideal if you are travelling with your family. 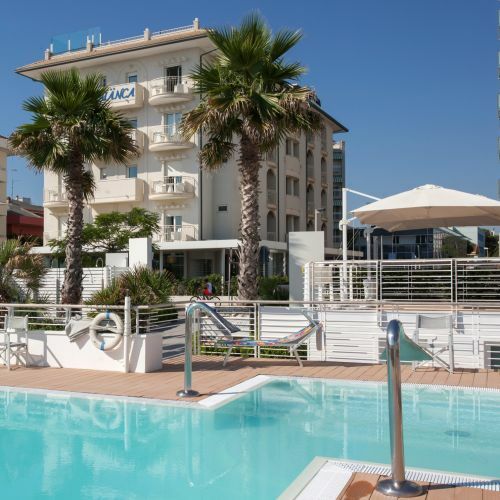 Found directly overlooking the seaside, all you have to do is cross the pedestrian area of the brand new Riccione promenade to sink your feet into the sand! As we are particularly attentive to the needs of families, our hotel has been completely renovated and features large indoor and outdoor spaces where your children can safely run free. A perfect family holiday begins when the children are happy and when the parents are relaxed. That is why our family hotel has an area for children with games suitable for all ages where our Nanny will take care of the children during mealtimes. And just to make your lunches and dinners that bit easier, our Chef and all the other chefs at Hotel Cà Bianca, will prepare meals and special menus daily that have been created specifically for children, served at the time that is most convenient for mum: vegetable broths, vegetable purees, and – upon request - small pasta dishes, baby food and blended meat or fish. What’s more, the kid's menu that is offered everyday for the older children is served with no wait time! At Hotel Cà Bianca children’s entertainment is guaranteed: our miniclub for kids comes with complete with games and organises many activities in the hotel during meal times or even during the day, right on the beach at area 110. This is found just in front of our hotel and here children can unleash their creativity in countless games and themed parties. You can also find a playground with slides of up to 5 meters, and a nursery fit for children there! And if parents want a quiet moment just for yourselves, perhaps at our spa, Hotel Cà Bianca also offers a babysitting service that is available upon request (and for an additional fee).